For some reason, it might be that it remains the world’s largest economy, and generally behaves like police for the world, United States’ politics is interesting to people throughout the world. It helps that most of the world speaks, at least a little, English. When China finally surpasses our economy, people still won’t know much about what happens there, because the media remains controlled and the rest of us have trouble sounding out Chinese characters. The United States, so we’re told, is one of the last industrialized nations to have some form of socialized medicine. Of course, even private insurance, is a form of socialized medicine, where the large cost of individual care is socialized, or spread out, among a large group of contributors, but, thanks to the Obama administration, we are embarking on a government run version. And to hear a significant segment of the United State’s population, it’s clear that this country is following the failed policies of the Soviet Union and other socialist nations. ‘Don’t they follow history,” they scream “socialism and communism have failed!” This argument seems to be pretty effective judging by the votes in the last mid-term elections. • And that, have you ever visited Europe? It’s not that bad there! We already have socialized medicine. It’s called Medicare and Medicaid. Whether or not we should expand these programs is worth discussing, but it’s not like we’re not already participating in the socialist experiment. There’s also Social Security. Does the name indicate nothing? This is a social program that some claim has helped to eradicate old-age poverty. It does so by taking over the decisions of ordinary people and putting those decisions in the hands of the government. That’s what social programs do. If a politician truly believes that the United States should not be socialist, why are some programs untouchable? I spent much of 2010 in Europe, mostly in Germany, but traveling throughout. Germans, facing the big questions about how they are going to pay for the medical care they have, looked on at our bickering with confusion. “The United States plans to follow our model just when we’re wondering how we can afford it” they told me. Because they’re actually exposed to our politics, they often laughed at news of our slide toward socialism. Germans point to their Danish neighbors who have the world’s highest tax rate and yet the people are happy about it. Failed socialist systems indeed. Above all, I spent some time traveling around Europe on business, staying in hotels, eating food and interacting with people and there’s one unmistakable fact about it. It’s not terrible. People work, and eat, and have families and vacations. They plan for the future and seem not to be overly terrified about the role of their horrible, controlling governments. Am I suggesting that we should follow in their footsteps? Hardly. I just want to point out, the sky is not falling. I may not want us to do things exactly like these countries, but there is no need to run around screaming that the U.S.A. is becoming the U.S.S.A. I actually lived in two of those failed socialist states: Germany and Holland. Of course, no one calls these two countries socialist, except, of course the countries themselves. I’ve written elsewhere in this blog how glad I am to be back and how proud I am to be a U.S. American. I don’t want us to follow every policy of the Europe, because I believe that those policies stifle innovation and ambition; that they limit entrepreneurship and encourage waste; that they give a sense of security to people without a clear plan how future generations will pay for it. Yet, I still found myself questioning whether I’d made the right call. Not worrying about your retirement or healthcare sure makes day-to-day life a lot more pleasant. People around the world watch our politics because, well, it’s entertaining. It’s a laugh to hear us exaggerate the swings of policy. It’s comic relief to hear us profess our commitment to capitalism when those with perspective see otherwise. Bringing balance back to politics might be as simple as reading some foreign newspapers and learning how other’s think. After all, many of them actually know first hand what to be afraid of. 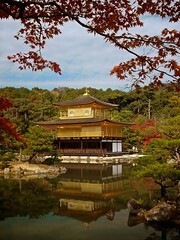 I jostled for a view of Kyoto’s one of most renowned sites: Kinkakju, the golden pavilion. The place is so obviously photogenic it, seems positively futile to take a picture of it at all. Surely, thousands of photographers have taken shots in the most perfect light and with the very best lenses and conditions. What, the self-reflecting photographer must ask, am I bringing to the table here? This question didn’t stop me, or the hundreds and hundreds of fellow tourists, from giving it a try. Armed with high-end digital SLR cameras or arms stretched out grasping a cellphone, each of them was determined to record this memory, and maybe bring something home that might convey the beauty of the distinctive architecture and setting, even though thousands of such photos are available, many without copyright on flickr.com. The flag bearer for travel photography might very well be the National Geographic Society. The Society began in 1888 and they have been sending happy photographers filled with wanderlust to every corner of the earth ever since. The amazing pictures and stories that they brought back have become an inspiration to millions of travelers and camera owners since but, no matter how great your pictures are, don’t expect to become one of those lucky devils paid to go to darkest recesses of the planet! The reality is that professional travel photography, where professional means making a living, is all but dead. It’s been swamped by technology and one of the National Geographic Society’s missions: the shrinking world. It’s statistics. If a million monkeys stand in front of Yosemite’s half dome taking a million cellphone pictures a day then naturally, every once in a while, one of them is going to snap something rivals Ansel Adams. It’s bad news for the aspiring travel photographer, but even the the original goals of the Society make at least a little less sense today. The founders wanted to organize “a society for the increase and diffusion of geographical knowledge.” The magazine was essentially the first to use photographs to tell their stories, but there is clearly something inadvertently ethnocentric about pictures of sadhus in India being more interesting to their readers than ministers in Minnesota. Which of those is a travel photograph? Some time ago I posted several street photos I snapped during a walk in Chennai, India. A couple of my contacts on flickr.com where I posted these are also from India. When they walk around snapping nearly the same pictures as I did, are their pictures also travel photography? How about pictures I take in Boulder, Colorado near where I live? No travel photography for you then? Considering portrait photography? Your market is has shrunk thanks to the occasionally great snaps that people make at home. Sure, you could do better in a half hour, but they were around at just the right time to catch that perfect smile–after all, they were around for thousands of worthless snapshots as well. Except, perhaps, for spec photography, where the photographer is asked to go out and take a very specific shot, on time, and within a budget, there is little sacred left for the professional photographer. Even those spec shots have seen considerable competition from cheap stock photography websites filled with snapshots of everything under the sun by another million monkeys. I am not suggesting that there is anything wrong with those monkeys. Hand me a banana, as I am clearly one of them. I’ve cut into the professional photography market myself with a few paid photos and few paid gigs, which doesn’t mean I am professional, of course, but rather illustrates the point that market for whatever it is professionals believe they’re offering is barely enough to support all them all. Photography has exploded as a result of a trend to document and share every moment of our lives (often, no matter how trivial) but all those extra pictures have diminished the need for professional photography. Worse, it makes me wonder why I was standing there in front of Kinkakuju with a tripod, waiting and waiting for the cellphone grasping arms to get out of my shot. At the end of the trip, I simply could have asked some one flickr if I could hang their shot in my home instead. The light wasn’t that good when I was there anyway. Any time you travel far enough from your own home base, even a nature hike can turn into a cultural experience. The day before our hike lead us passed amazing views of the Tiger Leaping Gorge and the towering mountains and tiny flowers surrounding it. But the hike also brought us closer to the historical lodges of the tea trade, the hemp growing farmers and the impacts of the tungsten mine above us. 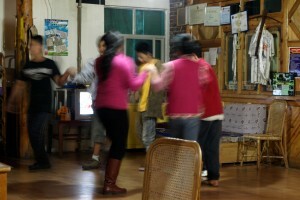 That evening, in the small hotel, we had dinner, but we were also invited to join in a impromptu folk dance by the maids and cooks of the hotel entertaining themselves in a place without much of the attractions of a city. The next morning we hiked down to the gorge below. There is an entry fee for the hike to defray the costs of building and maintaining the crumbling wooden walkways, low fraying rope guard rails, and dangerous, 50 feet long rebar ladders that enable a safe a sane journey to the gorge and back. Our tour included the fee but we donated a few more yuan just to be sure, since the infrastructure is built by local villagers and not by the Chinese government. They also maintain a few fruit stands and toilet with quite a view near the gorge. The dangers of walking across aging wooden planks and washed out trails is drowned with ever greater intensity as you approach the river itself. 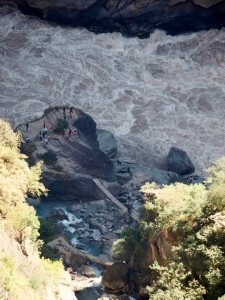 Here at middle Tiger Leaping Gorge, the river is at its narrowest and all that water churning and squeezing through a bit over a dozen meters thunders so loudly that our trusty guide has to yell at us to be sure we go the right way. The hike is steep down and even steeper if you choose the optional ladders route back up. The ladders are, well, just ladders, but the last one is long, slightly loose, and very exposed. Of course you can climb a ladder, but slip on this one and you’ll bounce down the canyon like a rag doll. Hey, you get what you pay for! After taking in views of the gorge, from up close and personal, to grand vistas at the top, we return to our hotel for lunch and to await our scheduled bus back to town. Here we meet a very proud Chinese family who, in spite of our guide Daniel insisting the Chinese don’t hike, have just hiked to the gorge and back with their 72 year old father. Dad is justifiably all smiles for his accomplishment and, even without a word of English, he wants us to know. Having just finished the hike ourselves, ladders and all, we’re every bit as impressed as he wishes us to be. We also meet fellow western travelers including an executive from a British company who helps me with a few Chinese phrases (the trip’s almost over, but maybe now I’ll finally be able to ask for a vegetarian meal! yo mei yo, mei yo rodeh tsai). We meet French travelers Alexis and Gautier and chat with them during lunch and then on the bus back to Lijiang. The two are a trove of knowledge with insight about travel, politics, and religion and so pleasant to chat with that we later join them for dinner. 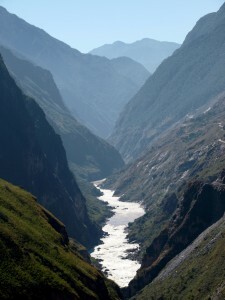 So, did we hike into a gorge, or see a folk dance performance, learn about local economics, discover that the Chinese are more varied than our guide lead us to believe, gain insight into living and working as an expat in China, or stumble on travel tips to Turkey, Iran, and beyond? Often, the pleasant surprise of travel is getting so much more than what you planned.